We are again making our annual trip to the Lubbock area to attend Kay's Teague-Miller Family Reunion in Shallowater, just northwest of Lubbock. 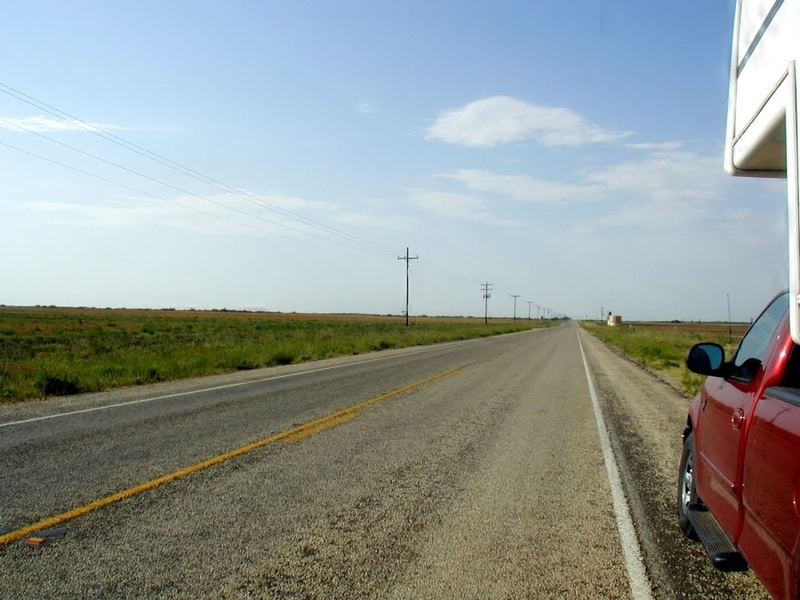 We decided to check out some of the state parks on the way from Houston to Lubbock, and back. 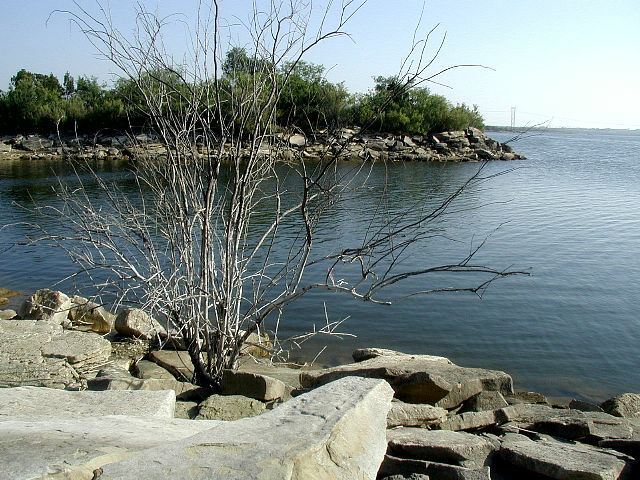 Our first night out was at Lake Brownwood S.P., then one night at Abilene S.P. and finally a night at Lake Colorado City S.P. 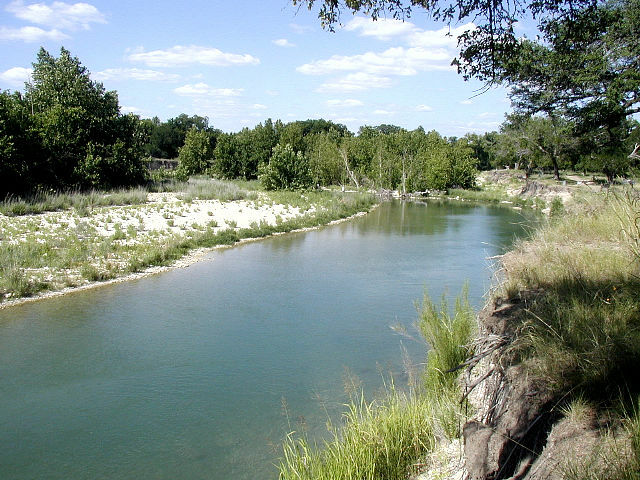 On the way back home, after a brief stop in Stanton to visit relatives we spent three nights in South Llano River S.P. 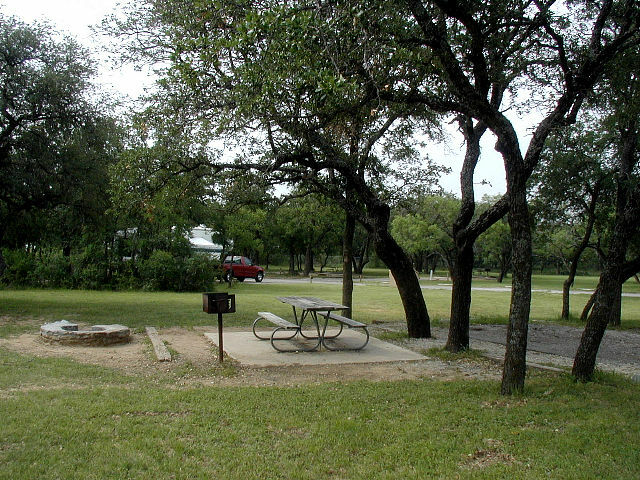 Our final stop before getting back to the Houston area was at River Shade RV Park in Seguin, located on the banks of the Guadeloupe River. 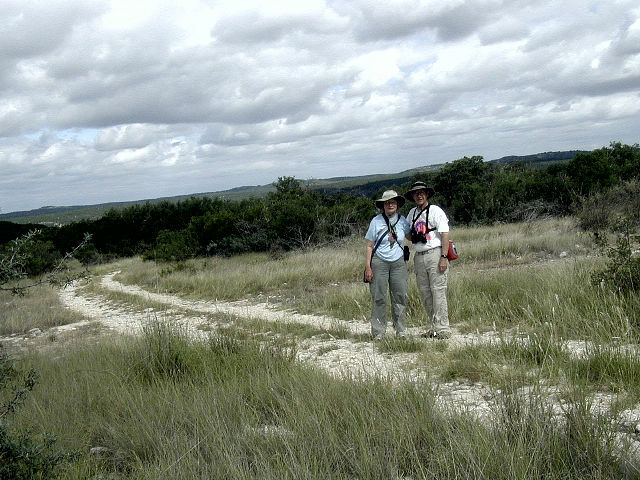 [Tuesday] June 9th we took TX-99, IH-10, TX36 and US-84 northwest from Richmond to Lake Brownwood State Park. This was a full day of driving for us to get there. We left home at 9:30am and arrived at the park at 6:30pm. After we settled into #59, Kay made supper and we enjoyed it while the a/c was working to cool things down. It was actually pretty nice outside, light overcast sky and in the mid-80's outside at 7pm. After supper we rode around the park until dusk. < All alone in the park. [Wednesday] This was a nice cool morning - about 74, but lower humidity and still overcast, so after breakfast we walked down to the lake. Then we walked up the road to the lodges and back. We saw lots of common birds but also a Laughing Gull on the lakeshore. We got back to the trailer after a 1 1/2-hour walk and it was still only 80 degrees. It was very peaceful in the park with very few campers in the Comanche Trails area. Most of the campers were in the Willow Point area. 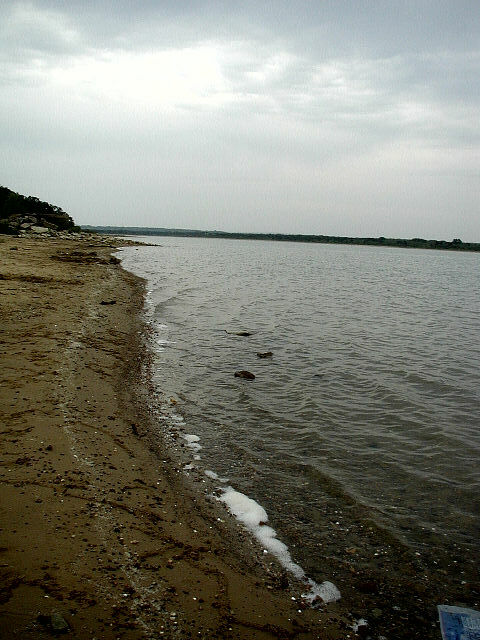 < Lake Brownwood. < View of lake from lodges area. After lunch we packed up and left the park and headed to Abilene State Park via TX-279, FM-1850, FM-585, TX-206, TX-84, FM-613 and FM-89. We arrived at the park and shortly after we got set into site #86, a West-Texas severe thunderstorm came through. There was plenty of high wind, lightening and thunder, some hail and plenty of heavy rain. It stormed for about 45 minutes then was nice and cool (mid-60's) afterwards. After supper we decided to walk around some and see what the condition of the trails were. We walked along the southern portion of Elm Creek Nature Trail. The trail was in good shape for the amount of rain we got. [Thursday] In the morning it was clear and sunny and started off at 65 degrees - just right for us to check out the other trails and see if new birds. We walked to the Buffalo Wallow - actually used by herds of buffalo around the time of the Civil War. We walked the Eagle Trail and the remainder of the Elm Creek Nature Trail that we had not walked yesterday. The trails are very good and only had a few spots that were too wet. We got back to the trailer around 10am and it was 80 degrees by then. < Buffalo Wallow. 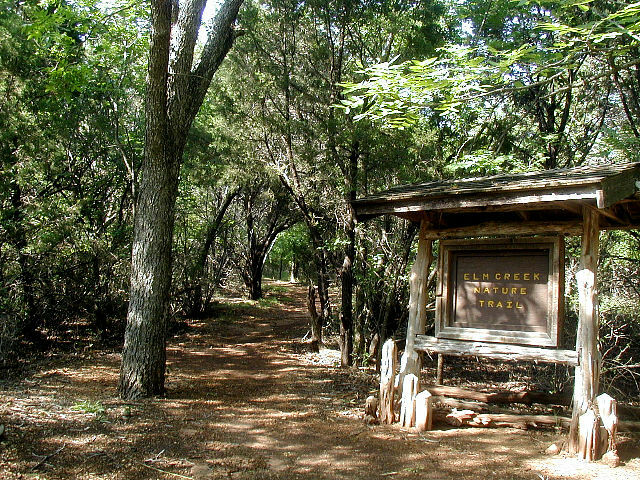 < Entrance to Elm Creek Nature Trail. 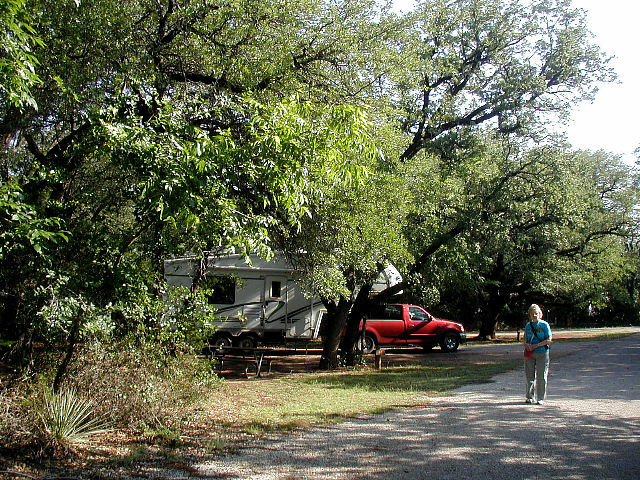 The afternoon was spent moving from Abilene SP to Lake Colorado City State Park. 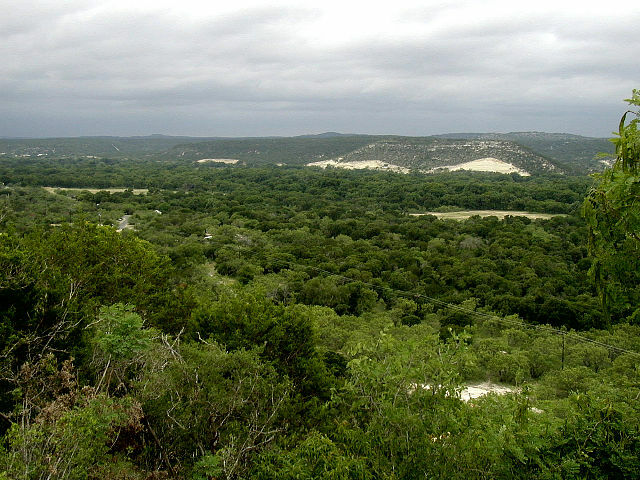 We traveled along FM-89, FM-126, FM-153, TX-70, IH-20, FM-163 and FM-2836. 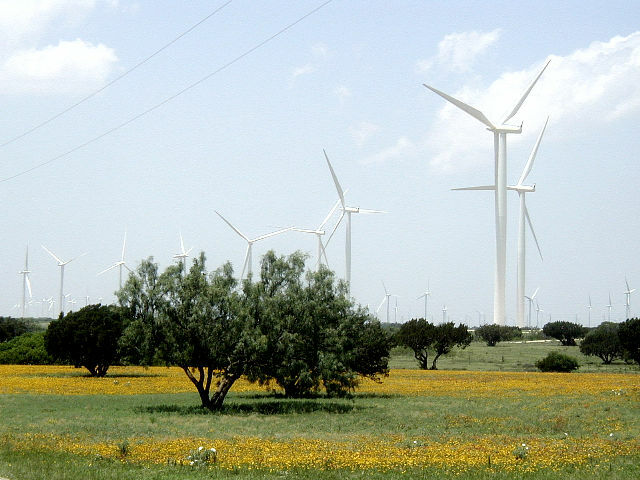 If you want a scenic up-close drive through hundreds and hundreds of wind turbines for generation of electricity, then travel along FM-89 and FM-126 from Buffalo Gap to Nolan. 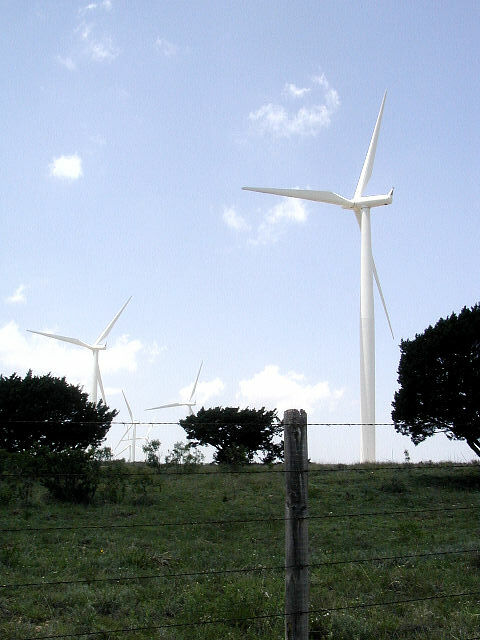 It's like being in a forest of turbines. We arrived at Lake Colorado City SP around 5pm. It was sunny and blazing HOT - the thermometer on the trailer said 106!! We sat in the trailer waiting on the a/c to cool and spotted several colorful birds out the windows. After supper around 8:30pm it was cool enough too walk down to the lake to the covered fishing barge. 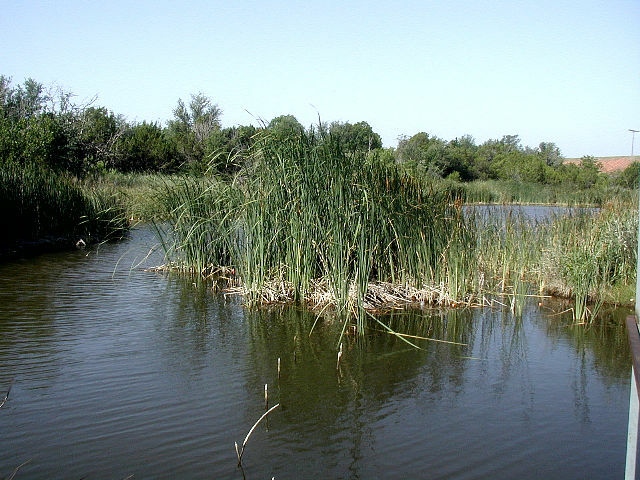 It is a nice place to fish, but the ranger said that fishing was not very productive. We watched a pair of Eastern Phoebe feed their young in a nest built in the rafters of the cover. [Friday] We hiked a short portion of the trail that goes along the lakeshore. 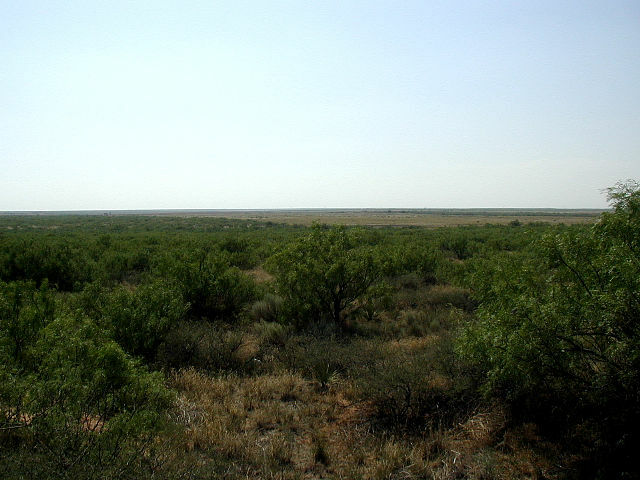 It is a good trail through the cactus and other arid vegetation. 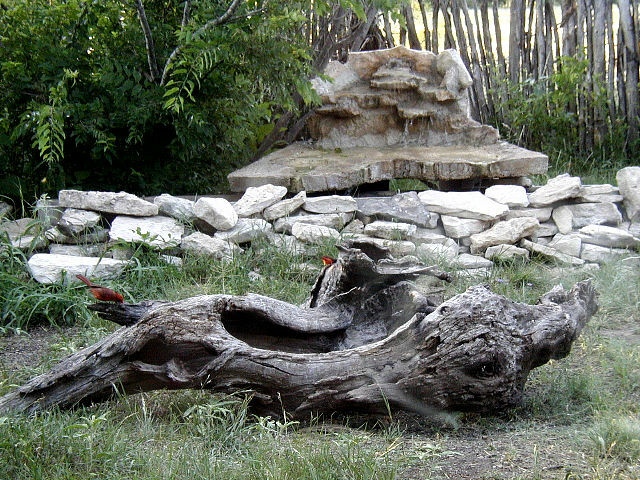 When we got back to the Mesquite Circle Camping Area, we sat outside and saw a whole list of interesting birds. Among the colorful birds were Brown-headed Cowbird, Sissor-tail Flycatcher, Northern Cardinal, Curved-bill Trasher, Bullock's Oriole, Say's Phoebe and Ash-throated Flycatcher. Finally the heat ran us back into the trailer a/c about 11am. < Campsite #29. 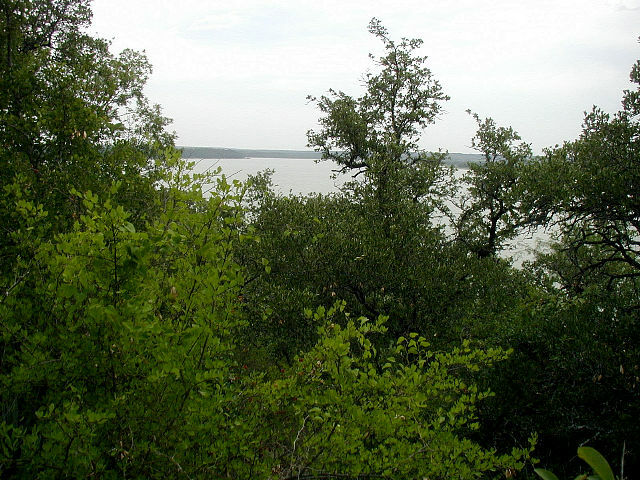 < < Lake Colorado City from the hiking trail. 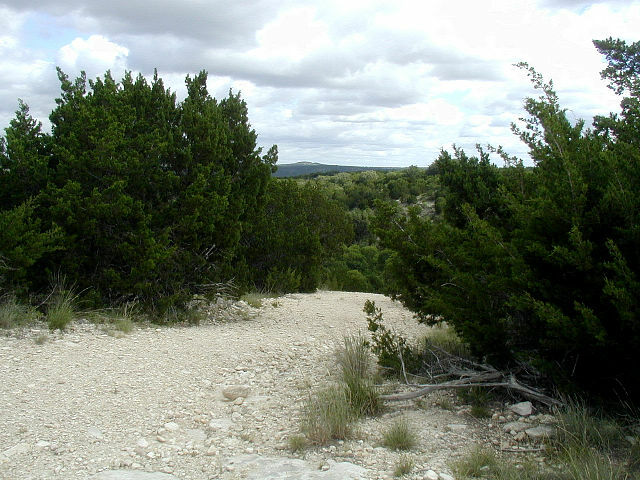 In the afternoon we left the park and drove up to Shallowater via FM-208 and US-84. 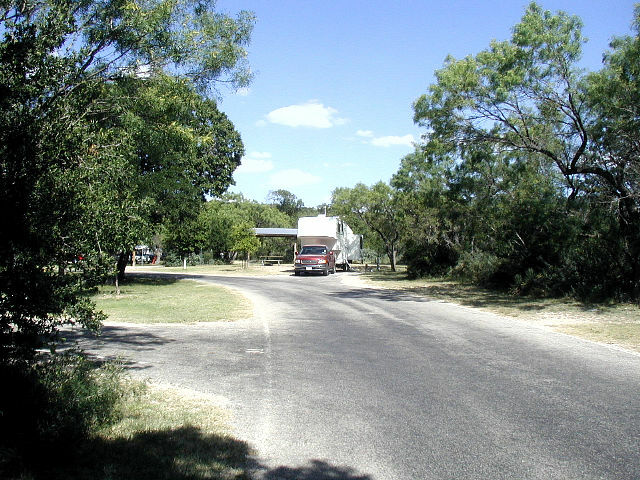 We arrived at Richard's RV Park about 4:30pm. It was hot and dry. The temperature was about 98 with 12% humidity so the "feels like" was 91. Even though it was hot, the low humidity made being outside feel OK. We settled into the first site and had a nice supper and then Kay made a desert for the reunion tomorrow. [Saturday and Sunday] Both days were involved with the family reunion activities and visiting with relatives. We enjoyed the fellowship and good food. Sunday afternoon after the reunion ended, we drove south from Shallowater to Stanton via FM-179 and FM-137. We arrived in Stanton as the June Trade Days were closing down. 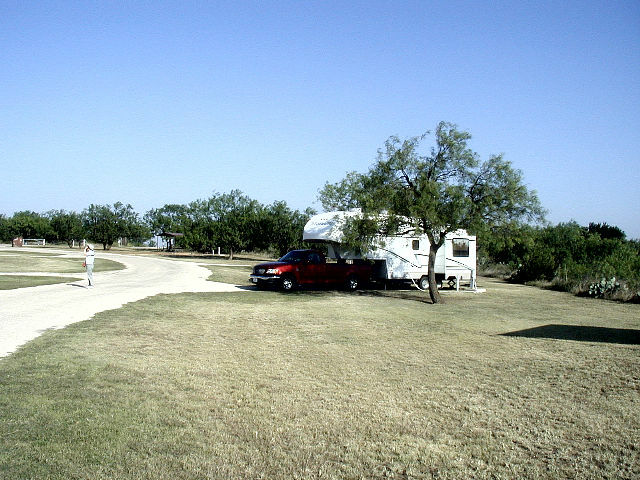 We set up camp in The Convent RV Park that is located next to the old Convent site. [Monday] We met a relative that lives in Stanton and he drove us out to the old Houston Ranch and took us around to see some sites of interest to us. In the afternoon we drove to Odessa to visit some friends. < West Texas around Stanton. 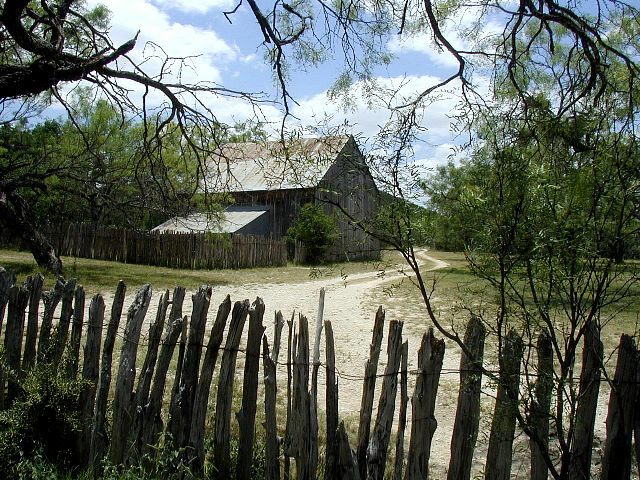 [Tuesday] In the morning we left Stanton headed south on FM-137 all the way to Ozona, then east on IH-10 to Junction and the South Llano River State Park. We set up camp in site #30 in mid-afternoon with the temperature around 100 degrees under an intense sun. But again, with the low humidity compared to Houston, it wasn't so bad. This is a very popular park and was near full when we arrived and was completely filled by Wednesday night. 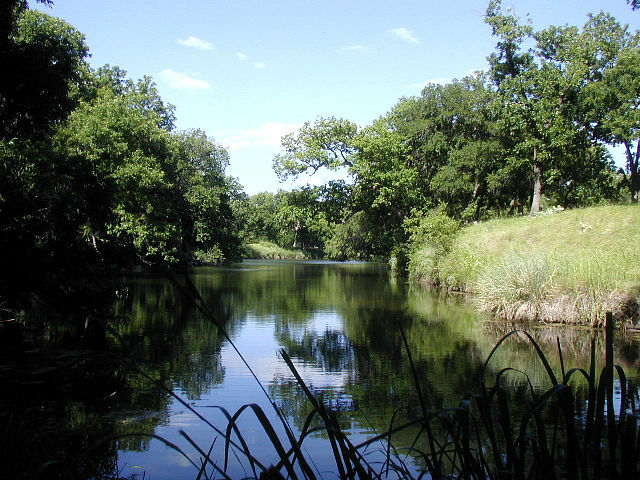 It has something for everyone - tubing on the river, fishing, hiking, and excellent bird watching with the best blinds we have seen anywhere. It is a must-stop when near Junction. 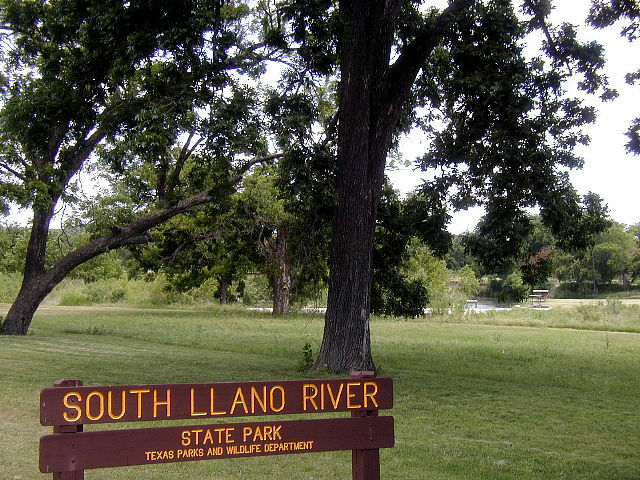 < South Llano River State Park entrance. < Site #30. < View from Acorn bird blind. After supper we walked down the trail to the river and stopped along the way at the Acorn bird blind. It is a very nice blind with comfortable padded seats inside a protective shelter, with running water and food for the birds. We saw many birds and fortunately we saw the one that we had been hoping to see - the Painted Bunting. We saw both the female and male. In addition, we saw Cardinals, Yellow-throated Warbler, Lesser Goldfinch, Carolina Chickadee, Black-crested Titmouse, Summer Tanager and White-winged and Inca Doves. 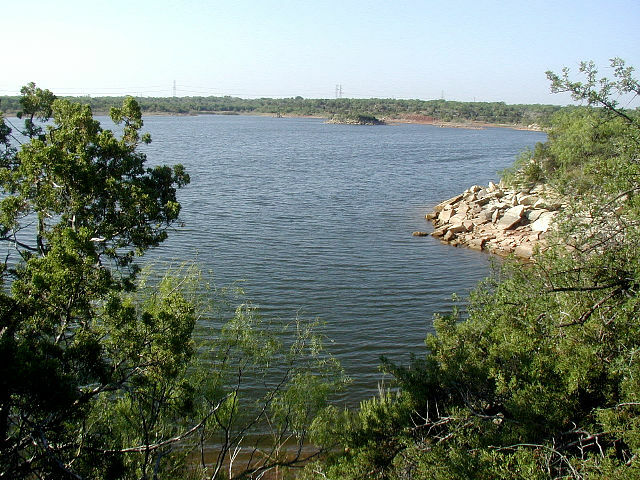 We walked past Buck Lake as we continued to the South Llano River. We saw several deer as we returned back up the trail. [Wednesday] In the morning we walked around the camping loop to the Juniper Bird Blind and stopped for a while. Afterwards we walked along a maintenance road to the Agarita Bird Blind. Both were productive with many birds being attracted to the food and running water. 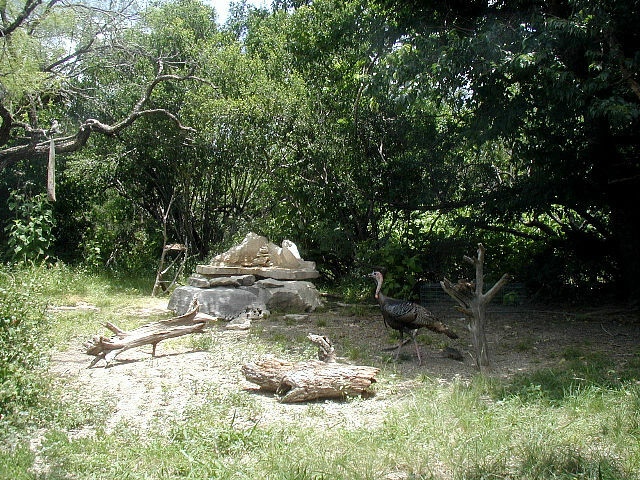 After lunch we drove into Junction to shop for food and on the way out we stopped at the Lora's Bird Blind on the entrance road and we saw two wild turkey come up and eat some of the bird seed and drink from the fountain. We saw several new birds there. < Old Barnyard inside park. < Wild Turkey. After we returned from Junction, we walked back down to Buck Lake and to the river. On the way back we stopped at the Acorn Bird Blind again for another productive session. After supper we walked back down to Buck Lake and watched the fireflies come out at dusk. Many hundreds appeared from the grass next to the lake. 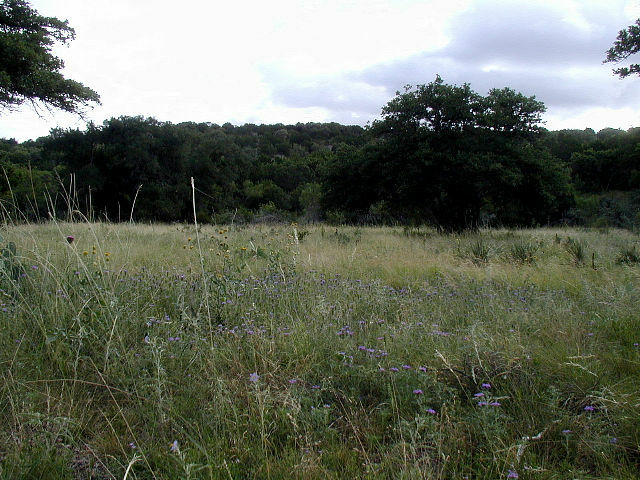 < Field near entrance to camping loop. < Buck Lake. 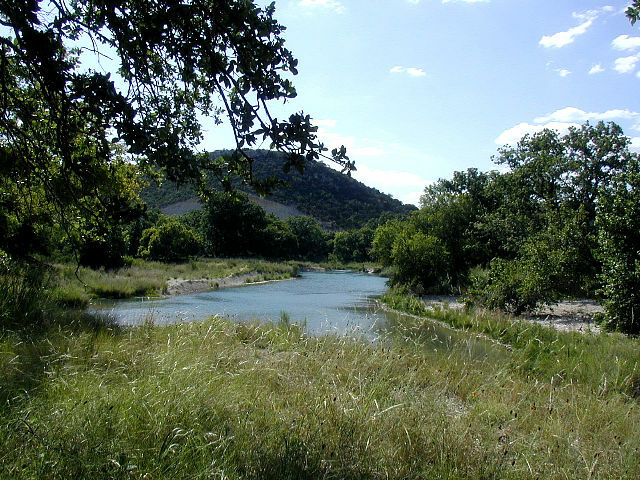 < < South Llano River. [Thursday] This morning we decided to hike around the Fawn Trail - about 2.6 miles of good trail, except it is steep and rocky in some spots. We put in at the east end and went counter-clockwise and ended at the Agarita Bird Blind. We spent some time watching the birds. Afterwards we went by the Park Headquarters and looked at their nature display. We sat on the front porch and watched the Barn Swallows bring food for their hungry babies in their nests above the porch. We were looking for the Vermillion Flycatchers that were supposed to be around the headquarters. We saw them out in the barnyard next to the headquarters and got a good look at the spectacular male. 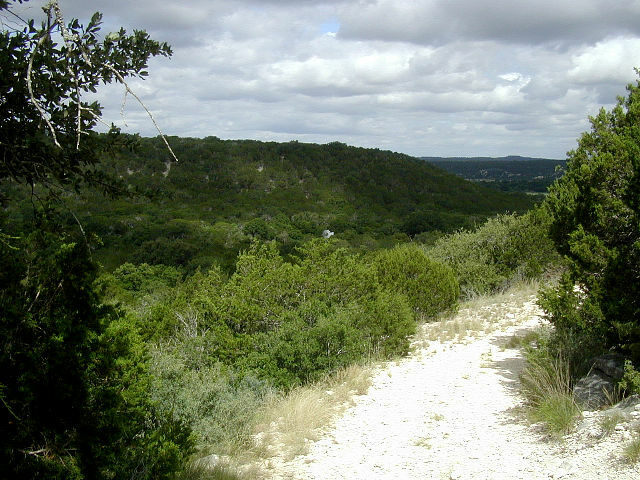 < < < Views on Fawn Trail. 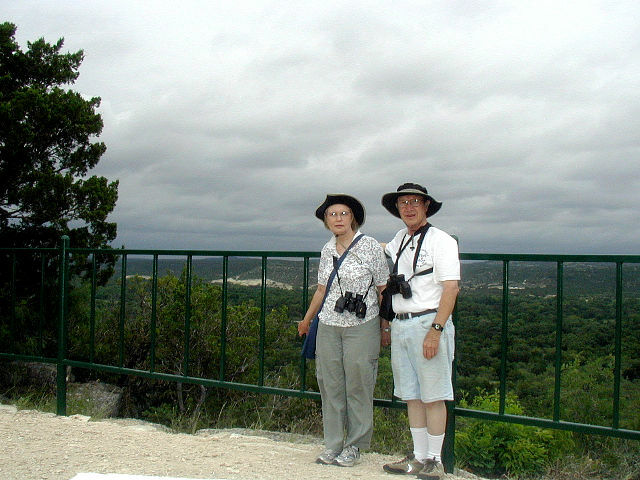 < Kay & Lawson on Fawn Trail. 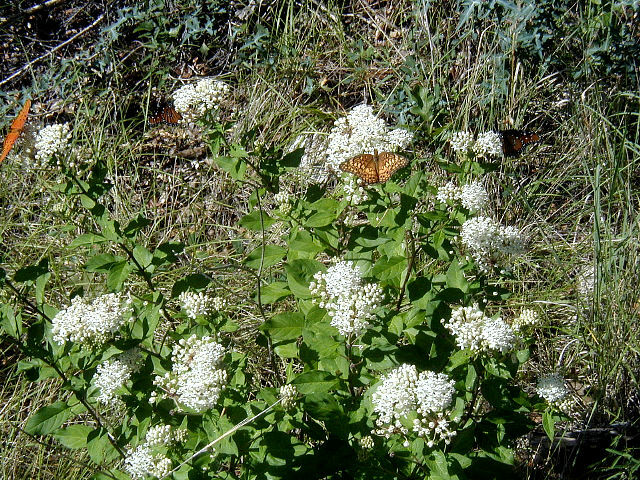 < Lots of butterflies. 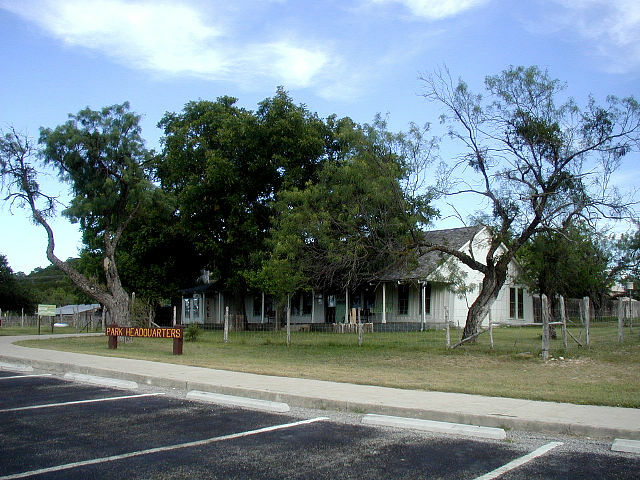 < Park Headquarters. After lunch, we went back to the Juniper Bird Blind for about an hour. Later in the evening we went back to the Acorn Bird Blind. After supper we drove on the entrance road and went to Lora's Bird Blind again. [Friday] In the morning we walked up to the Scenic Overview before it got too hot. 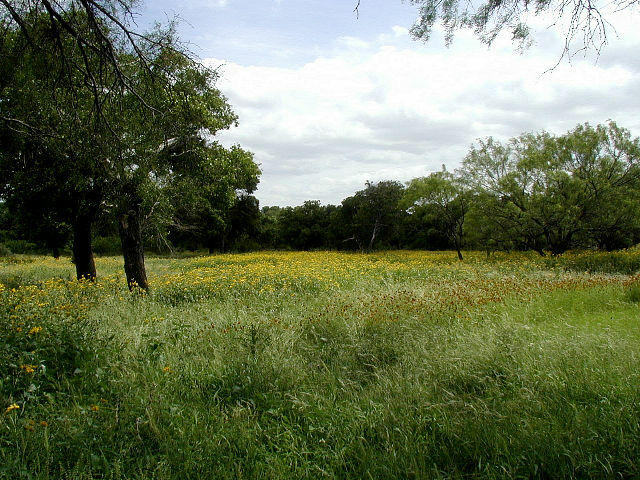 It offers a pretty view of the park and surrounding ranches. After lunch, we followed IH-10 east from Junction to Seguin. 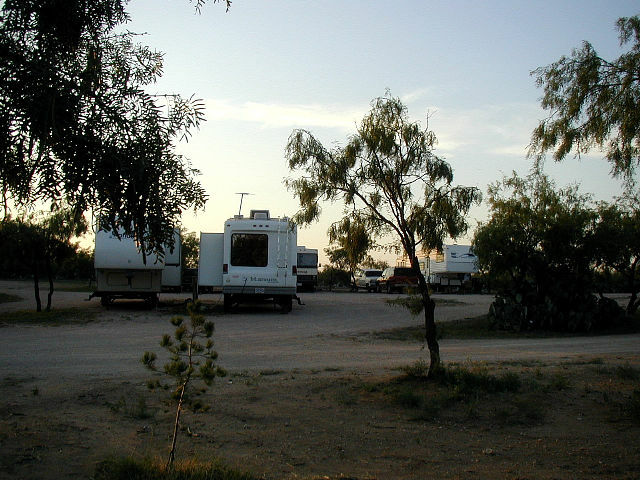 We spent our final night out at River Shade RV Park. [Saturday] After breakfast, we cleaned the trailer inside and headed out on IH-10 to Houston. We arrived in Richmond by mid-afternoon, after a roadside stop in Schulenburg for lunch. This draws to a close our visit to West Texas. We hope you enjoyed the photos and brief descriptions of our activities. God willing, join us again soon for another RV adventure.